I don't own any sweatshirts. This is not an exaggeration like when I proclaim that I have nothing to wear, there really aren't any sweatshirts in my closet. I used to have some big, cozy, hideous looking ones, but they all went out long ago when I argued I didn't need them and if I got cold then I should just put on a sweater. However, I've come to realize that lounge wear is just as important as any other type of apparel and a really chic sweatshirt needs to come into my possession. I have a couple of zip-up hoodies that very very rarely leave the house, but otherwise I'm sweatshirt-less as well. I think I may need a "chic" sweatshirt too--maybe that sparkly shoulder one! I have two zip up hoodies and a pull over college alumni hoodie. I rarely leave the house in either for anything other than a trip to get milk or as outwear when I go to the gym. 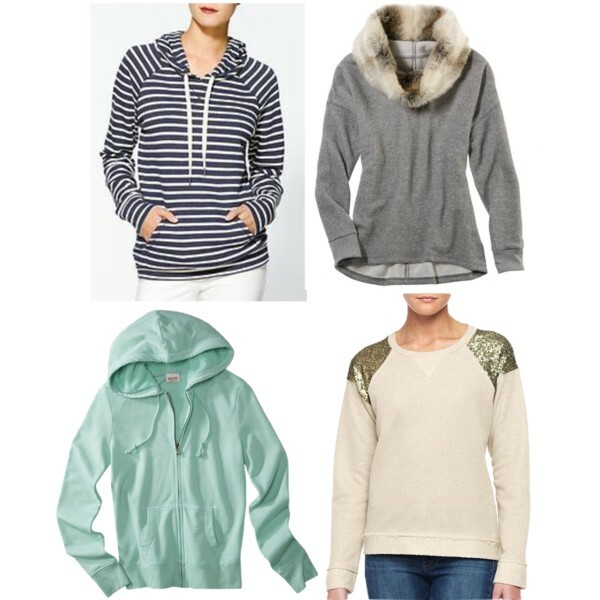 I've been really intrigued by sweatshirts with lace or sparkly embellishments, so I love the bottom right hand one! Sweatshirts have really come a long way over the past few decades. When I was a kid, I remember them being so big and bulky, so I shied away from them for a while. I do have a few hoodies now, but I could use a chic one too. I love that striped one! I love the one from Mango:) So sassy! Muah, lovely. I do love this roundup though..I'm all about comfort and I love each one! I love me some cute and comfortable sweatshirts! I hate feeling all dumpy when wearing sweatshirts! I love that striped sweatshirt. It's like chic lounge wear! I do own a sweatshirt or two for those lazy college days where I've got art classes and don't wanna dress up, but they're not nearly as cute as these. I seriously really want that second one with the fur collar... it's so cuuuuuuuute. I love the Fuzzy Popover,at Aerie! Very cute choices! Who doesn't like a chic sweater, right? Like the one with sequins on the shoulders. I also like studded ones. I usually only wear sweatshirts while lounging around the house, but if I had more like these I might venture out in them sometimes. I especially love the MNG one with the sequins. I styled a hoodie holiday style today on my blog- check it out! I've been thinking I want some cute sweatshirts too! I have a few from my sports teams that I like, but would like something a bit more fun and girly too! The one with the fur! I was just looking at Anthropologie loungewear and right now they definitely have some sweatshirts and lounge dresses that are not too expensive. So tempting! Lounge wear is a must but any of these will make you look super fly while you are lounging! Love the sparkly shoulder one! I had one a looong time ago, but then i realized that they dont go with most things i have. I really like the striped on in the top left! omg i need that grey one with the fur..
i agree. i like nice loungewear. very nice selections. I love love love that sequin sweater - like i always say, sequins make anything awesome.